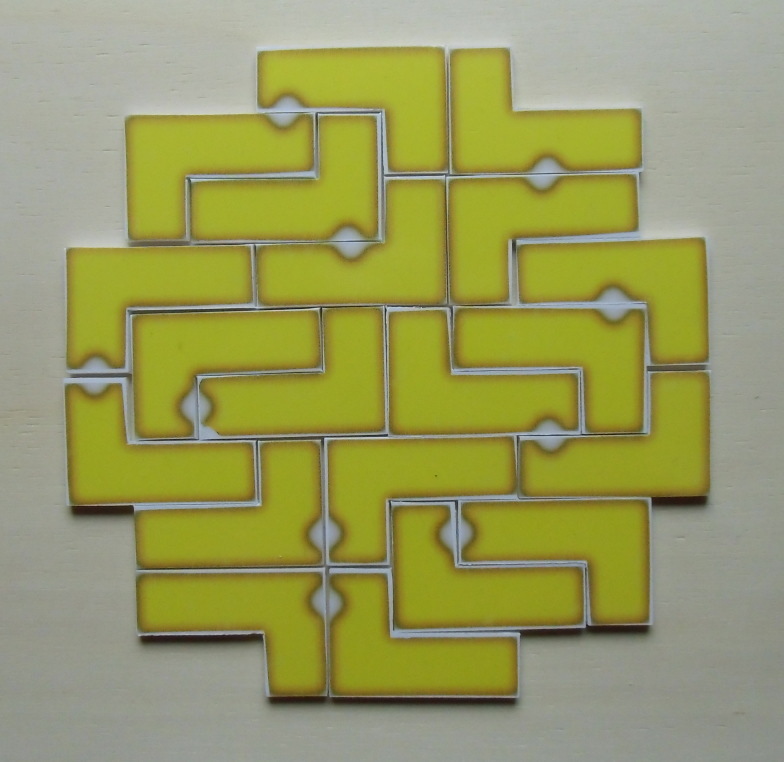 The picture above shows a construction with square symmetry using all one-sided 20 L-tetrominoes with one notch. For two-sided and one-sided L-tetrominoes with a given number of notches the number of different pieces and some possible constructions are listed in the following table. With only 10 pieces it should be possible to solve the 4x10 and 5x8 rectangle by hand. Some other figures with rotational symmetry or one or two axis of symmetry can also be solved and the solutions are here. Here are the solutions for the 10x48, 12x40, 15x32 and 16x30 rectangles and for the23²-7² square ring using all L-tetrominoes with three notches. There are 20 pieces with all three notches getting the same color under checkerboard coloring. These pieces were arranged in a 8x10 rectangle and the remaining area was split into two parts. The L-tetromino has no symmetry. Therefore the set of one-sided pieces has twice as many elements as the set of two-sided ones. Here are the 20 one-sided L-tetrominoes with one notch. I cut the pieces from white hard foam board and attached transparent adhesive to the pieces. The construction for the 8x10, 4x20 and 5x16 rectangles can be derived from the the solutions for the 4x10 and 5x16 rectangles using two-sided pieces and their reflections. Beside the figure in the title some other symmetric figures can also be packed and the solutions are here. 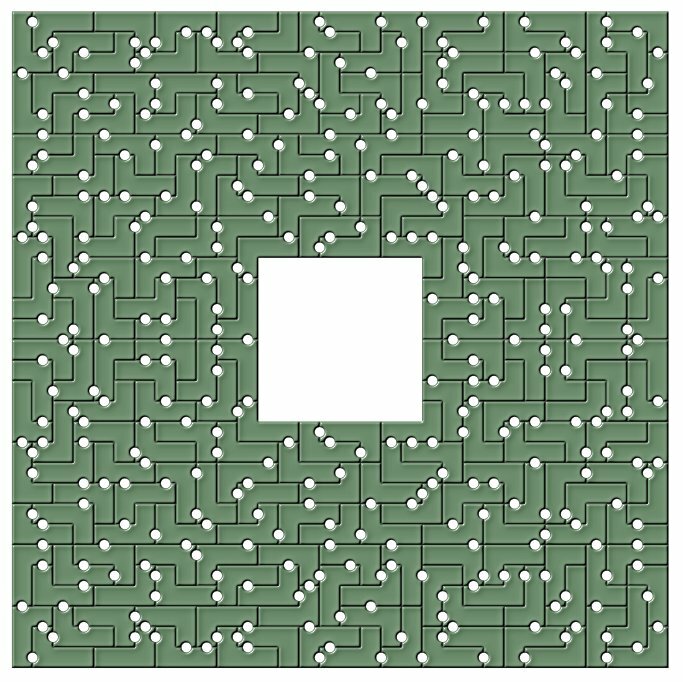 The total area of the 90 one-sided L-tetrominoes with two notches is 360, which is a multiple of 8. Therefore the necessary condition to cover rectangles with this set holds contrary to the set of two-sided pieces. If you split the rectangles you can't choose equal sized parts, because their area isn't divisible by 8. Therefore you can't derive a construction by solving half the rectangle with the two-sided set. Beside the 8x45, 9x40, 10x36 and 20x18 rectangles, for which a solution is shown, it should be possible to cover the 12x30 and 15x24 rectangles as well, because the total length of the border is smaller. Instead I constructed a square ring of size 19²-1². The set of one-side L-tetrominoes with three notches has 240 elements with a total area of 960. You can easily cover rectangles of size 10x96, 12x80, 15x64, 16x60, 20x48, 24x40, 30x32, if you take the solutions for half the rectangle with the two-sided set and add the reflected solution. For the square ring of size 32²-8² the same method was used. First a U-shaped half of the ring was solved with the two-sided pieces and the solution was reflected. To avoid too long notch free borders at the reflection line some notches were preset.